Genius Maxfire G-08Xu USB Game Pad, Black, USB Port, Ergonomic game controller design, 8-Way D-pad Copyright © 2019 ComXpert International CC - COPYING IS ONLY ALLOWED FOR THE PURPOSE OF SENDING US ENQUIRIES. E&OE. Are you still using a keyboard's directional keys for up and down, left and right movements in games? Well here's an 8-way D-pad will let you quickly move and have everything within your reach. The Genius G-08XU D-pad fits perfectly in your fingers and it's much easier to use than the directional keys. 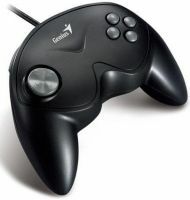 And, with 8 action buttons, including 4 ergonomic triggers; you can use both hands to play your favorite game! , ©2013 ComXpert International CC Copyright © 2019 ComXpert International CC - COPYING IS ONLY ALLOWED FOR THE PURPOSE OF SENDING US ENQUIRIES. E&OE. The best price and guaranteed service and backup from official computer suppliers in South Africa for the MUL063 Genius Maxfire G-08Xu USB Game Pad. The Genius MUL063 Genius Maxfire G-08Xu USB Game Pad is available for R79. The product is sold by ComX Computers as new. Prices are valid today 2019-04-22 (before 2019-04-23 , by quote, while stocks last). The product is expected to be in stock, although this is not guaranteed. Find related MUL063 Genius Maxfire G-08Xu USB Game Pad products in our Game hardware Category for even more options. Read reviews and find out about MUL063 Genius Maxfire G-08Xu USB Game Pad. Discounts, specials and cheap prices only at ComX Computers.